Creech St Michael Parish Council had their meeting in the Baptist Church unexpectedly, on 4th January. The main areas to report was an up date on the Monkton Heathfield Development, where there is a window in time to allow for more public consultation and possible changes to plans to be considered. Future meetings with TDBC, the Parish and other groups will take place later in the year. in Creech. Next meeting is on 7th February back in the village hall. Full minutes of January meeting will be published on 7th February. Today, after a long ten year campaign by Fred Thatcher and my wife Anna, I was delighted to see the campaign to replace the dangerously high stiles is now finally over. Less than two weeks after Creech St Michael Parish Council had agreed to fund a shortfall of £300 for three replacement kissing gates, I saw workmen quickly erect very easy to use kissing gates. No more difficult climbing over stiles more than four feet high with slippery steps and sharp blackthorn bushes always ready to cause a nasty cut. When you look at just how convenient the new kissing gates are you start to wonder why there isn’t more widespread demand for kissing gates, especially when high stiles discriminate against the elderly and not so nimble? Response to consultation on 4000 house proposals for the Parish of West Monkton as conducted by Urban Initiatives on behalf of Taunton Deane Borough Council. There are two parts to this response: the first is West Monkton Parish Council’s position regarding the proposal for 4000 houses; the second part pertains to the consultations as conducted by Urban Initiatives on behalf of TDBC. West Monkton Parish Council wishes to state its total and absolute opposition to this proposal. The track record of this Council’s co-operation with TDBC in respect of the 1000 home Monkton Heathfield development is well documented, including meetings of the West Monkton Community Engagement Panel facilitated by TDBC over the period 2006 – 2008. At all times, the Parish Council believes it has acted democratically and in the best interests of the Community it represents. The Council finds it incomprehensible therefore, that the consultations run by Urban Initiatives make no reference whatsoever to the work of the CEP; indeed, Urban Initiatives has shown no knowledge of the existence of the CEP, let alone the work it did in conjunction with TDBC, SCC and the developers’ consortium. Urban Initiatives has consistently redrawn the plans for the 1000, muddling them with the proposals for 4000, reaching a proposal for 5000 houses, apparently starting from scratch. This is absolutely contrary to the public position of TDBC up to the middle of 2010. The Parish Council has accepted the permission for the 1000 houses with employment land, community hall, and new primary school, granted by TDBC Planning Authority last year, and the recently agreed Reserved Matters on the first 327 houses, consequently it is continuing its dialogue with the developers’ consortium, and others, for the integration of these houses into the Parish. The Parish is currently home for about 2000 parishioners, so to integrate a further 1000 houses potentially represents a doubling in size of the Parish, and will take substantial effort by community members and the Parish Council to ensure integration and harmony. The Parish Council has not been told by Taunton Deane Borough Council when the decision to put 4000 houses in Monkton Heathfield was made, and there has certainly been no consultation on this decision with the Parish Council or the wider community of West Monkton. The Parish Council would wish to see evidence that the decision was made using proper democratic process. Because of the process now being followed, West Monkton Parish Council finds itself wondering if it is seen as a ‘push over’ as the community had accepted previous developments (Farriers Green, Acacia Gardens, St Quintins, Parkmead) and now additionally the recently proposed 1000 houses, and has conducted itself in a reasonable manner. Has it been assumed that West Monkton Parish is less likely to complain, compared with other locations in the Deane, which the Parish Council believes could be developed to have more appropriate infrastructure connectivity and transport? West Monkton Parish Council states categorically that enough is enough. In total 5000 houses are being foisted upon this community – the size of a small town – so why not build a separate new town? Urban Initiatives indicated that the new development would be the size of Wellington. The Parish Council believes it has done its share to enable TDBC to meet targets set by government. An extra 4000 houses in Monkton Heathfield would result in a linear development. The Parish Council considers that future development could be elsewhere, to allow Taunton to develop in the round and not be constrained by the ribbon of the motorway. The new government’s planning guidelines and support for the Big Society should allow the business and residential community of the Parish of West Monkton to have a genuine input into the consultation process. There are a number of sites that could encourage Taunton’s development in the round thereby ensuring that there is a greater alignment between housing provision and employment growth than any linear development at Monkton Heathfield. It has been very difficult for the Parish Council to decipher and understand the brief that Urban Initiatives are working within. As it would be reasonable to assume that the briefing of Urban Initiatives came from TDBC, why were they not informed of all the reports submitted to TDBC by the West Monkton Community Engagement Panel? If TDBC did not brief them, then who did? The ignorance of the Parish, the villages within it, and the geographic location of the Parish demonstrated by Urban Initiatives was, to those invited members of West Monkton community attending the meetings, absolutely staggering, and tested the credibility of the consultation process. The fact that an urban consultation group was employed indicated a very significant difference between TDBC and West Monkton Parish Council. By its actions, TDBC had apparently endorsed the aims and objectives of the West Monkton Community Engagement Panel which were to work towards the integration of the new development of 1000 houses within the Parish. The Parish is rural. The Parish had been led to understand, by the actions of TDBC that the rural status of the Parish was clear and understood and not under any sort of challenge. The Parish Council has not received any notification from TDBC that it is to become an urban settlement. So why was a company that presumably specialises in urban development employed to do the consultations in West Monkton? Urban Initiatives demonstrated very ably, and on numerous occasions, that they had no clue how the rural environment works, exemplified by their description of Cherry Grove Hill in West Monkton as ‘one of many tracks leading into the Quantocks...’ and not understanding that ‘West Monkton Village Hall’ (a reference to the Parish) is located within the settlement of Monkton Heathfield. Repeated requests to Urban Initiatives to offer solutions regarding adequate infrastructure were denied. As has been stated in TDBC policy, housing should be employment led, so it is incomprehensible that the 14Ha employment land required for the 1000 house development is now being replaced with an allocation of 12Ha employment land for the total 5000 houses. As a consequence of the above, participants in the consultations expressed total loss of credibility of Urban Initiatives, total lack of faith in them and their ability to deliver. At the last consultation (there have been two so far), requests were made by Councillors and Community members alike, that the objections to the proposal would be recorded, and assurances that this would be done were given by TDBC and Urban Initiatives; and that these objections would be presented whenever the matters from the meeting were referred to. This request seemed to be something Urban Initiatives remained unaware of, so it was repeated and an assurance given that this would be the case. If Urban Initiatives have documented these requests and given them the credence they deserve, then there should be in existence and available for the record, a very long list. However, due to the way the consultations were conducted, the Parish Council has absolutely no faith that any attention was paid to the objections stated. In short, the consultation was anything but a consultation and the presentation to a restricted number of members of the community of West Monkton by Urban Initiatives was a ‘done deal’. The 4000 extra houses apparently were not the subject of the consultation at all, the subject of the consultation were ideas for the design guide for the proposed estate. This means that almost without exception, members of the West Monkton community and Council invited to attend the consultation concluded they were being brought to the sessions under a false premise. The conduct of the consultations was questionable. Participants were invited to place tiles on a computer planning board representing proposed areas of housing, but it was not explained that the tiles’ position on the board were being saved to a computer file. Members of the Parish Council, realising this unspoken activity, found themselves feeling very uncomfortable in the position of quasi-decision making in which they had been placed as it is not reflective of the democratic process, nor does it sit well with the Parish Councils’ Code of Conduct and Standing Orders. So members declined to participate, and so did the majority of other invited participants. Eventually two people were prevailed upon to put the tiles on the planning board. Will these arrangements of houses then be produced supposedly as a product of the consultation? And will the explanation be that the community chose the design itself? If so, it is based on a foundation not very close to the truth, indeed, it was observed that one of the people who put tiles on the planning board, identified and known not to reside in the Parish, was taken to one side in a two on one session and allowed to place tiles by herself. Is this what Urban Initiatives have been briefed to do? Is this what they will call consultation? – and more importantly, will this be the basis on which Taunton Deane will develop the 4000 houses? It would be reasonable to assume that the county town would be seeking more valid and credible ground on which to base major decisions. Why was only a Monkton Heathfield board available for the placing of tiles? Participants wished to put tiles on the board in wider directions, but were told that TDBC had said it was not acceptable to use a larger board – again adding to the impression that the proposal for 4000 extra houses at Monkton Heathfield was a done deal and not the subject of the consultation, and that TDBC was not overly interested in the views of the Parish Council. The Parish Council does not have any faith in Urban Initiatives, and does not believe that they are acting in any way, shape, or form in the best interests of the Parish by holding these meetings that are closed to the public. The Parish Council has therefore decided that it will only send two observers to any further invitation to Urban Initiative meetings. These observers will take no part in the meeting or the board games, and will be present solely to report events back to the Parish Council. It is with regret that the Parish Council submits this statement, and would appreciate a response from TDBC. Should TDBC see fit to continue with Urban Initiatives’ services, a response from Urban Initiatives would be appreciated. On 5th May this year there will be Borough, Parish and Referendum Elections taking place. If you are interested in becoming a Parish Councillor you will need to complete a nomination form available from Taunton Deane Borough Council or the Clerk from early March. Nomination papers have to be signed and returned to the Returning Officer by noon on Monday 4th April 2011. The Role of the Parish Councillor is primarily to represent the parish on issues concerning residents. Councillors play a vital part in representing the interests of the communities they serve, together with helping to improve the quality of life and local environment. Monthly Parish Council meetings take place at the Village Hall with various ideas and thoughts on issues raised by people, which are discussed and voted upon. These will include planning applications, highway and footpath issues, setting the annual precept as well as conforming to the statutory regulations and powers given to Parish Councils. If you have strong views on how your parish could improve and help local people, then perhaps you could be a fresh face and voice to CSM Parish Council. If you wish to know more information please contact the Clerk, Jill Loader on 01823 400801 or email parishclerk@creechstmichael.net or speak to the Parish Councillors. A ten year campaign by two Creech Heathfield pensioners for new stiles they can climb over took a big step forward this week. 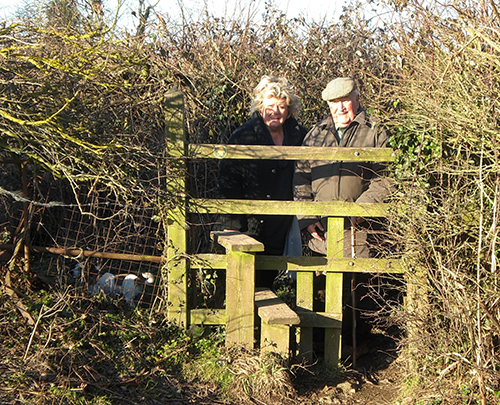 For over ten years, Anna Caddy and Fred Thatcher have argued that three stiles along a public footpath were ridiculously high and too dangerous for the elderly and the young to climb over. The first step of one stile is 22” high compared to around 12” on most stiles. The second step is 35”from the ground compared to a norm of 18”. To add further risk of injury the top rail on one stile has been measured at over 4’ 5” from the ground. This has meant walkers have not been able to cross the stiles without considerable difficulty and risk of injury. Pauline Hallett, a neighbour of Mrs Caddy, fell and gashed her leg badly when crossing one stile in 2006. She still bears the scars to this day. 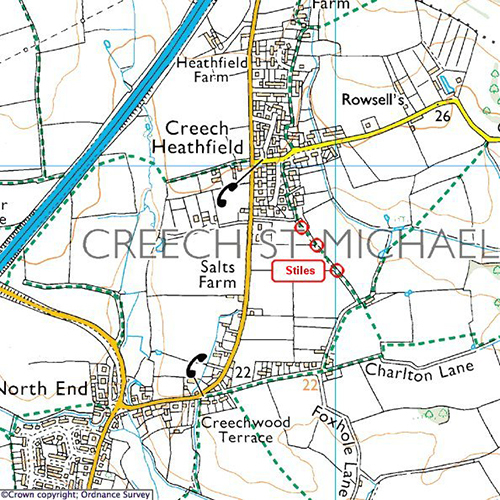 The stiles cross farmers’ fields on the public footpath between Worthy Lane and Meads Drove, Creech Heathfield (see map). Since 1999, both Anna and Dave have campaigned, but with no success, for Somerset County Council to lower the stiles. Fred Thatcher, aged 88, has even described the stiles as “An Old People’s Assault Course”. However, in December 2010 SCC finally agreed to replace the three stiles with more accessible kissing gates that do not need to be climbed over, on condition of a contribution of £300 from Creech St Michael Parish Council. I am pleased to report Creech St Michael Parish Council voted at their January meeting to fund the £300 shortfall. Both Anna Caddy and Fred Thatcher (pictured below) are delighted with the news. Their long-standing campaign will soon mean that elderly people can start to enjoy a very pleasant circular walk across the fields of Creech Heathfield, Foxhole and Charlton.